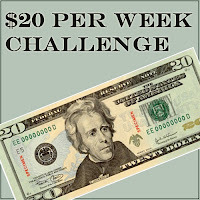 Could you survive on $20/week? Doesn't seem like very much. And in fact, for a family of 4 $20 is only one trip to a fast food restaurant, one trip though Target, a single admission to the movies. Could you live on $20 a week? Even if it was only for one month (four and a half weeks)? Clearly I am not including my rent, utilities, or other standing expenses (the cost of gas for my husband to commute to work, our monthly payment for ballet lessons etc) but I am including EVERYTHING ELSE. Anything we would normally charge to our credit card or pay cash for. Groceries, entertainment, dining out, clothing, toiletries, gifts, household goods, haircuts, even home improvement projects!!! To put that cut into perspective, our last three month's of credit card bills have all been in excess of $2000. That means my goal is to spend 1% of my what we normally spend in a month! ONE PERCENT! I do have an extensive pantry and freezer stockpile right now, and I will be able to use coupons and gift cards but the goal is not spend any MONEY. I was inspired to do this by Stephanie at Full of Great Ideas who is having a challenge to not spend anything on "non-essential" items. To me that is too easy. I can always say that food and dining out and buying a gift for an upcoming birthday are "essential." The true test is saying, can you find cheaper alternatives for the essentials? Can you be creative and stretch a dollar.. REALLLLLLY stretch a dollar. I will try to post weekly with where the money went and if I was able to stay in budget. Here goes nothing!